To leave a special message for her family please use the "share memories" button above. Add your memories to the guest book of Gwendolynne Starmer. My best friend posted a meme on Facebook with this wonderful thought, and it made me smile and think about Gwendolynne Jones Starmer. 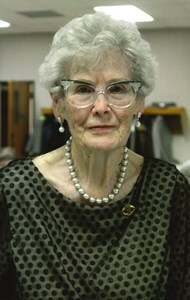 I found out recently that our dear family friend died January 18, shortly after her 95th birthday. She lived a long and wonderful life, sharing her musical talents with countless students and church parishioners over its course. She was one of my favorite people. When I was young, I’d go spend summers with my paternal grandparents in Olathe, Kansas. A couple blocks from their place was a huge old farm house where dear Gwen lived nearly all her life. She and my grandparents went to church together at St. Aidan’s, where Gwen was the organist and choir director. She always welcomed me to sing in the choir with my grandmother when I was in town. I was fascinated by Gwen’s old house, which was built by her grandparents back when the land under my grandparents’ house was pasture. At the time I was really into the Laura Ingalls Wilder “Little House on the Prairie” series, and although the town of Olathe had grown up around it, Gwen’s house gave wing to my imagination about that period. I LOVED to visit her there. There were old family portraits that hung on its walls, holding up the memory of her dear ones who had come before. They seemed huge and ancient to me! She had worn Victorian furniture that I assumed had always been there and a big grand piano in the parlor, where she taught her lessons. Sometimes we’d sit out on the screened porch off the kitchen, so different from the modern kitchens I was used to seeing, and have lemon cookies and milk. Other times I’d go exploring in her big yard and wonder about the old shed and chicken coop that remained. How my imagination ran wild! The last time I saw Gwen was in 2016 when I visited Kansas to celebrate my Mema’s 85th birthday. We went to visit Gwen at her big yellow house, and it was just as I remembered it. I felt an overwhelming sense of peace knowing that in this day and age in which things change so rapidly, her place was a constant. We sat out in the warm afternoon sun on the ornate iron furniture and chatted for a while. She was growing more frail, and I feared it might be the last time I’d hug her. The following fall, a couple months before her 94th birthday, Gwen threw herself a party. A BIG party. She even hired a big band for her “Celebration of Life.” More than 100 family & friends came and danced and ate and reveled in her joy. My family went – Mema even travelled from Florida to KC for it – and they had a ball. I was delighted by the thought of it! Gwen always made you feel like she was thrilled to see you and gave wholehearted hugs. She was beautiful and had a lot of style. (She wore glasses, and my favorite were her cat-eye frames.) Gwen was kind and inclusive. She shared her talents and helped others find their own. I’ll never forget her big smile, her lilting laugh, or how she used to exclaim, “Oh Shaw!” May dear Gwen rest in peace, and may her warm spirit live on in our memories and through our actions. I remember her at Emery Hall I was like 11-12 years old Im late enter new ksd in April 1978 at Emery Hall, Im sorry for your loss. I met Gwen when I worked as a secretary for St. Aidans. We would have a simple lunch, soup and some garlic toast. We always enjoyed our lunches together and we forged a very long friendship. As time went on, we started celebrating our birthdays at Cracker Barrel, a favorite of Gwens. We always shared our dessert, neither one of us could eat a whole dessert!!! Gwen became one of my dearest friends. We would talk for hours about things in life we loved. We had a feeling that if we'd gone to long before talking we'd call and one would say "oh my gosh i was just thinking about you". This went on for many years. We had a very special friendship and I will miss my best friend terribly, but I see you in heaven, Gwen! What a life well-lived by such a remarkable, wonderful lady! Heaven’s gain is our loss as everyone who knew her and called her “dear friend”. Our prayers of comfort and peace to Gwen’s family. So very sorry we are unable to attend her celebration of life service, but we will be there in spirit. ?????? Our family was deeply blessed by the life of Mrs Starmer. She taught piano to my daughter and son who both went on to be musicians in jr high and high school. My daughter continues playing cello, piano, guitar and other instruments today in various bands and at church in addition to being a studio musician for a few Christian music artists. We were at Mrs Starmers house many times when the kids were very small. That was more than 25 years ago but our children and family were deeply blessed by "Mrs Starmer". We always enjoyed her recitals and were very thankful that she continued to follow their development by showing up for their concerts in junior high and high school. Thanks be to God for the life of Mrs Starmer who always showed love and patience delivered with a bit of firmness and encouragement. Gwen was one of the sweetest ladies I ever knew. We toured with the Singing Fingers together and shared many beautiful memories together. Whenever I think back on my days at KSD, Gwen will always be a shining star for me. Gwendolyn was an amazing woman and impacted my life in so many ways. She was the music director at all Saints Episcopal church and again at to Saint Johns Dallas. I begin taking voice lessons from Gwen and studied with her for quite a while. She was such an uplifting and supportive person. I am so him so thankful I was able to know her loving fun spirit. I have many wonderful memories of Gwen (Mrs. Starmer.) Some of my favorites are sitting in her piano room with her ancient kitty curled up next to the bench as Gwen taught my girls to read music, play scales and notes and more importantly to share her journey, her thirst for knowledge, her love of history with them and inspire us all to live brave and open lives. She loved her children and grandchildren and us unconditionally. Thanks to the family and Harry for sharing Gwen with us. Much love to all of you.